AIDS Vancouver respects and upholds an individual's right to privacy and to protection of his or her personal information. AIDS Vancouver is committed to ensuring compliance with the BC Privacy Protection Act and the Canadian Freedom of Information and Protection of Privacy Act. AIDS Vancouver is accountable for the personal information under its control. AIDS Vancouver has appointed a Privacy Officer who is responsible for the agency's compliance with this Policy. An individual may choose to withdraw his or her consent to have his/her personal information used for any or all of these purposes. He/she may contact the Privacy Officer to make this request. Implications and ramifications regarding withdrawal of consent will be clearly outlined by the Privacy Officer. The only circumstances under which personal information may be disclosed to third parties is for the fulfillment of any purposes identified above, or as required by law. If personal information is disclosed to third parties for the purposes of fulfillment of any purposes identified above, AIDS Vancouver will ensure that appropriate security undertakings, such as confidentiality clauses in contractual agreements, are employed to protect the transfer and use of personal information. AIDS Vancouver does not sell, trade, or rent information to third parties. AIDS Vancouver protects personal information with appropriate security safeguards. Safeguards include physical, administrative, and electronic security measures. Any individual has the right to access his or her personal information under the control of AIDS Vancouver. The Privacy Officer will assist the individual with the access request. In certain exceptional situations, AIDS Vancouver may not be able to provide access to certain personal information it holds about an individual. If access cannot be provided, AIDS Vancouver will notify the individual making the request, in writing, of the reasons for the refusal. Questions or concerns regarding AIDS Vancouver's compliance with this policy may be directed to the Privacy Officer, at privacy@aidsvancouver.org, or by telephone at 604-696-4606. 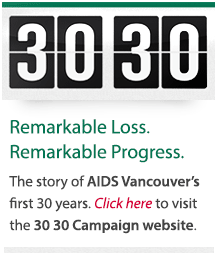 Keep in touch with AIDS Vancouver and signup for our newsletter! For Project details or information on how you can get involved, CLICK HERE.